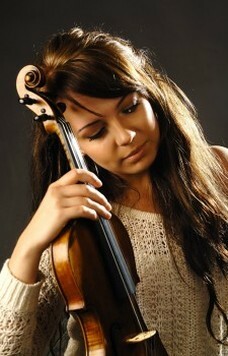 Mari-Liis Uibo, born in 1990, started to play the violin at the age of six with teacher Ivi Tivik. 1997-2006 she studied at the Tallinn Music High School, completed the Bachelor of Music program at the University of Music and Performing Arts Vienna in the violin-class of Professor Gerhard Schulz (Alban-Berg-Quartet) in 2012 and continued in the Artist Diploma program with Professor Milan Vitek at the Oberlin Conservatory of Music. She earned the distinguished Artist Diploma in May 2014. ​Since 2001 she has regularly taken part in summer-courses and masterclasses: Maestro Ivry Gitlis, Prof. Alexander Fischer, Prof. Anatoli Reznikowski, Prof. Per Enoksson, Elena Denisova, Ilia Korol, Areta Zhulla, Sirpa Lannes-Tukiainen, ISA 09 and ISA 11 – Interpretation of Contemporary Music (with Klangforum Wien and Nigel Osborne), string quartet training program (with Jupiter String Quartet).